Here at Border Surfacing we hold a range of experience in delivering specialised tarmac solutions in a variety of industry settings. Our small but enthusiastic team has been providing high-quality and durable tarmac surfacing services in England and Wales for over two decades, during which we have become the contractors of choice for numerous domestic and commercial clients. Among our services you will find motorway and rural road repairs, tarmac resurfacing, surface dressing services, and more. Our expert road surfacers are always ready to carry out professional tarmacing projects in private roads and driveways and to your exact specifications. We work efficiently and without causing unnecessary disruptions, and all our work is fully insured and guaranteed. 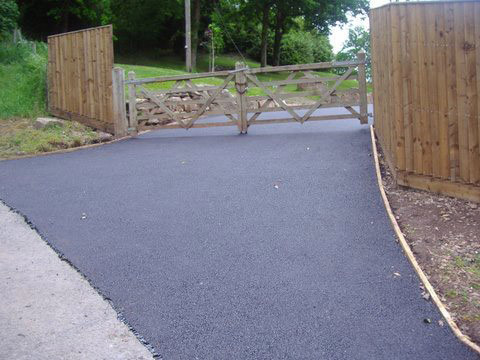 The result is a professionally finished driveway that will add value and elegance to your property. Our company consists of a team of tarmacadam contractors with extensive knowledge of all the asphalt types and combinations available. We aim for nothing less than perfection in every project regardless of its size or scope. Give us here at Border Surfacing a call, or send us an email to enquire about our specialist tarmac services, or to request a personalised and non-binding estimate and we will be happy to assist you with finding the right solution for your needs.